Medically known as mallet finger. A mallet finger is a disruption to the end of the tendon that straightens the tip of your finger. This injury typically occurs after jamming, cutting the back of your hand or crushing your fingertip. After the injury you will notice that the fingertip droops with an inability to actively straighten it out. 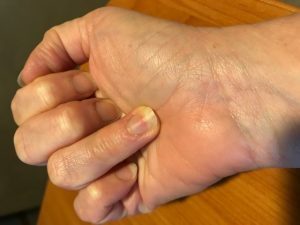 Mallet fingers can often be treated conservatively or may require surgery depending on the structures that were damaged. Conservative treatment will consist of use of a finger splint to hold the fingertip straight for eight weeks. A skilled occupational/hand therapist can ensure that you are compliant with splint use, educated on skin care, and instructed on safely weaning from the splint to resume normal motion and function. Surgical treatment may be indicated if there is a presence of a large bony fragment and/or if the fracture involves the joint causing misalignment. 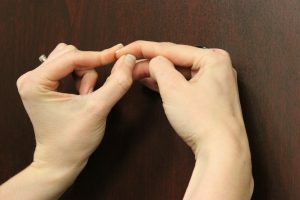 Also known as jersey finger and most often affects the ring finger. This injury presents with the inability to bend the fingertip down when making a fist. This injury typically occurs in sports such as football when the player catches his finger in another player’s jersey while trying to grasp it. After the injury you will notice inability to actively bend the tip of the fingertip down due to the tendon pulling off of the bone. This injury will require surgery followed by fabrication of a splint to protect the newly repaired tendon as well as very specific exercises to avoid stiffness and scarring from setting in. Occur when our fingertips get caught in doors, bad aim when using a hammer or dropping something heavy on the hand. These injuries can result in fractures, nail bed cuts that can impact future nail growth or even partial amputation. When any of the latter occur, it is imperative to seek medical intervention. When we crush our fingertips without observing something as severe as an amputation we often will try to ignore it and self-treat. However seeking the advice of a trained professional is always a good idea. For example, if there is an underlying fracture that does not get diagnosed it can lead to misalignment, lack of healing (non-union) or arthritis. All of these can result in future pain, chronic swelling and loss of function. These can happen with any activity involving a sharp object, but recently have increased due to the popularity of avocados and difficulty when removing the pit (stay tuned for our upcoming blog on this topic). A slip of the knife when cutting that avocado can result in damage to the skin, arteries, nerves and tendons of the fingertip. 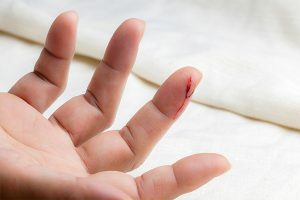 People often think if they can get the bleeding to stop on their own there is no need for medical intervention, but it’s not until much later when you realize you can’t bend the tip of your finger or you have lost feeling on one side of your finger. Surgical treatment may be necessary to repair the lacerated structures followed by therapy to help restore motion and provide techniques to ensure normal feeling returns. 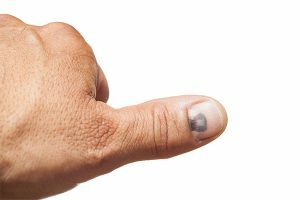 Fingertip injuries should not be ignored as they can result in significant impairment, which interferes with one of our most intricate parts of the body. If you suffer from a fingertip injury and are unsure on the course of treatment to take, contact an Athletico occupational therapist who specializes in treatment of hand injuries. Our experts can answer your questions to guide you through the proper treatment. 1. Institute for Quality and Efficiency in Health Care. “Homepage.” Homepage, Institute for Quality and Efficiency in Health Care (IQWiG, Germany), 16 Feb. 2021, www.informedhealth.org/. 2. Cologne, Germany: Institute for Quality and Efficiency in Healthcare: (IQWiG) 2006 How do hands work? (IQWiG) 2006.